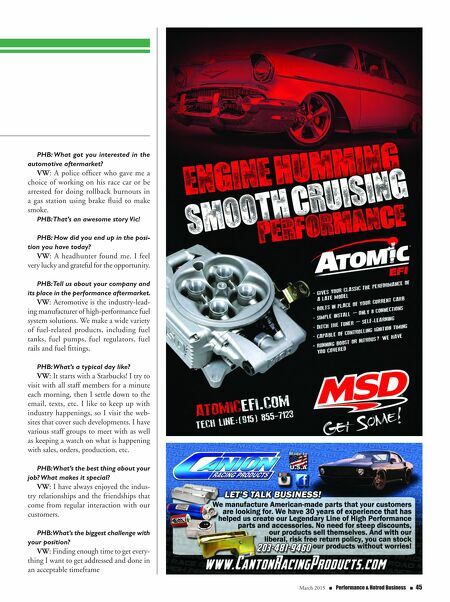 44 n Performance & Hotrod Business n March 2015 PERFORMANCE Vic Wood General Manager, Aeromotive Inc. By Regis Finn Meet Vic Wood PHB: So Vic, what was your first car? VW: It was a 1958 FC Holden Special. PHB: : In case anyone is wondering why a Holden, which is a pretty rare car in the U.S., Vic grew up in Australia where Holden's are very popular. PHB: If you could have any car, what's your dream ride? VW: It would have to be a blown Hemi stuffed into 1932 Ford Highboy Roadster. PHB: What's on your computer/phone wallpaper? VW: A picture of my wife, Arlene. PHB: Who's the person you'd most like to meet? VW: That would have to be Richard Childress. He is a remarkable man who has had a remarkable career. PHB: Please finish this statement: If I wasn't in the performance aftermarket, I'd probably be … VW: Lost! I love this industry and can't imagine doing anything else. I t is with great pleasure that I introduce to you Vic Wood. I have known Vic for many years, having worked with him at the B&M Performance Group, where Vic was the general manager of McLeod Clutches and I was the director of marketing for the group of companies. 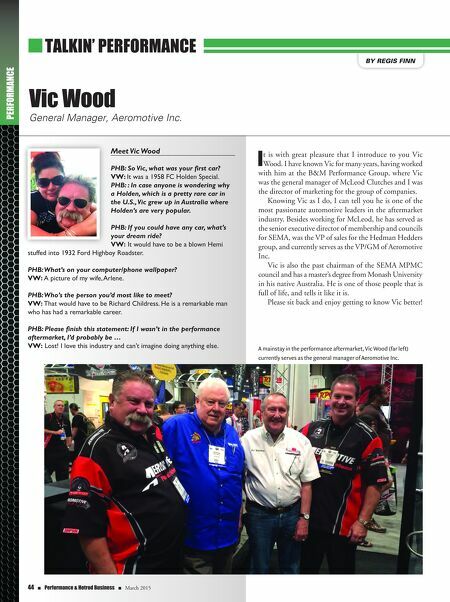 Knowing Vic as I do, I can tell you he is one of the most passionate automotive leaders in the aftermarket industry. Besides working for McLeod, he has served as the senior executive director of membership and councils for SEMA, was the VP of sales for the Hedman Hedders group, and currently serves as the VP/GM of Aeromotive Inc. Vic is also the past chairman of the SEMA MPMC council and has a master's degree from Monash University in his native Australia. He is one of those people that is full of life, and tells it like it is. Please sit back and enjoy getting to know Vic better! n TALKIN' PERFORMANCE A mainstay in the performance aftermarket, Vic Wood (far left) currently serves as the general manager of Aeromotive Inc.